Your students will love writing poetry with these poetry writing templates! 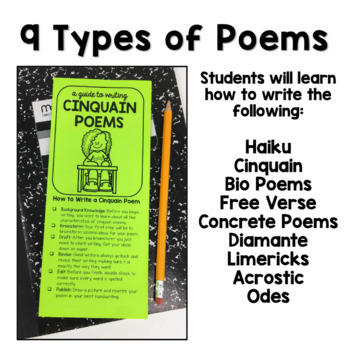 Students will learn how to write nine different types of poems and have fun expressing themselves through poetry. 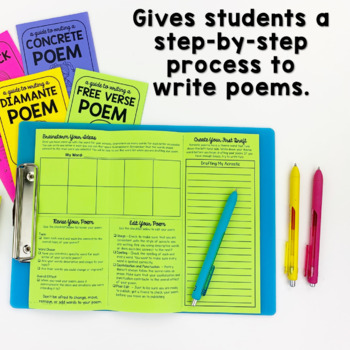 Each guide gives students a step by step process for writing that specific type of poem, and you will be amazed at how quickly your students will transform into poets! 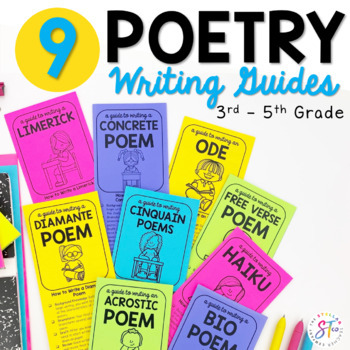 These poetry writing guides are the perfect addition to your Poetry Unit. 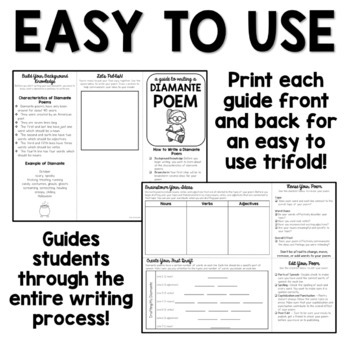 These writing guides are two pages and when copied front and back can be easily folded into a trifold that has all the information students need to get started writing poetry. Pair with my Poetry Posters and Anchor Charts for a complete poetry unit. Place in a writing center during National Poetry Month (April). Use as early finisher work. Click here to sign up to receive my newsletter. Get teaching ideas, product updates, and freebies, delivered right to your inbox. Click here to follow my store to be notified when new products are added.